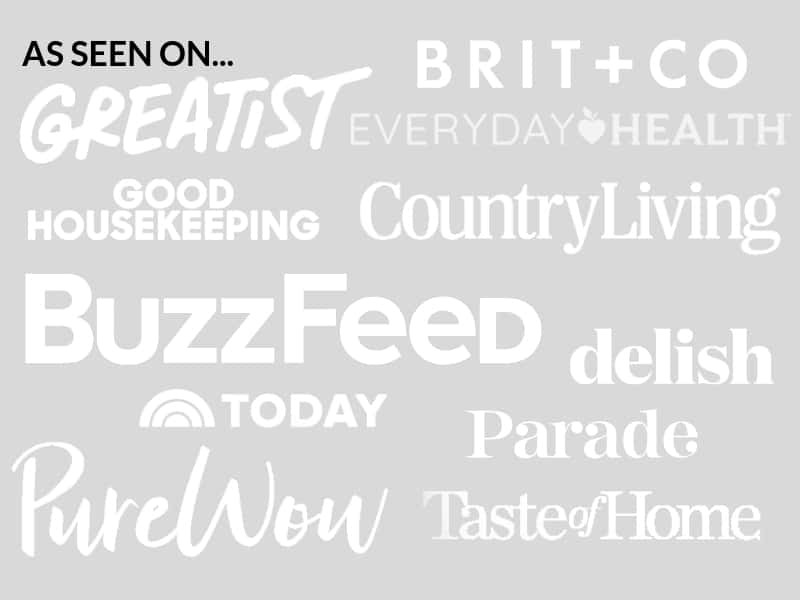 December 26, 2018 By Elizabeth Lindemann 24 Comments / This post may contain affiliate links. Growing up, I can’t remember a New Year’s day that didn’t involve Vasilopita. 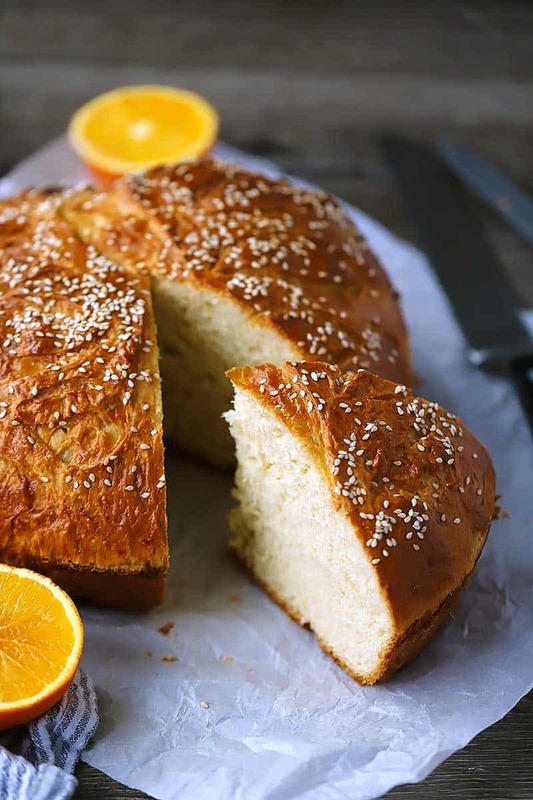 This Greek New Year’s Bread is sweet and moist, baked with eggs and milk, scented with orange zest, and topped with toasty sesame seeds. It’s brushed with an egg wash before baking and a pattern is carved into it with a sharp knife or razor blade, which results in a gorgeous loaf of bread with a deep, dark, chestnut-brown color. This is a traditional yeast bread, and requires two rises and kneading. Normally, I’m all about fast, easy recipes, and when I do make bread from scratch I usually use a no-knead recipe. Full disclosure: vasilopita is not very fast to make and it does get a bit messy. BUT it is relatively easy and it’s such a fun tradition that I love doing it once a year! Before I get into how to make this bread, there’s one more very special thing about it. Traditionally, a coin is hidden inside it when it is done baking. It’s slipped into the bottom and then spun around, so the cook doesn’t know where it is either. Whoever gets the slice of bread with the coin has good luck for the rest of the year. It’s similar to the Western European and New Orleans tradition of a King Cake. One time when I was little, I got the only coin in the bread for my whole church! I don’t really remember if I was especially lucky that year but I do remember it felt like I won something really, really big. 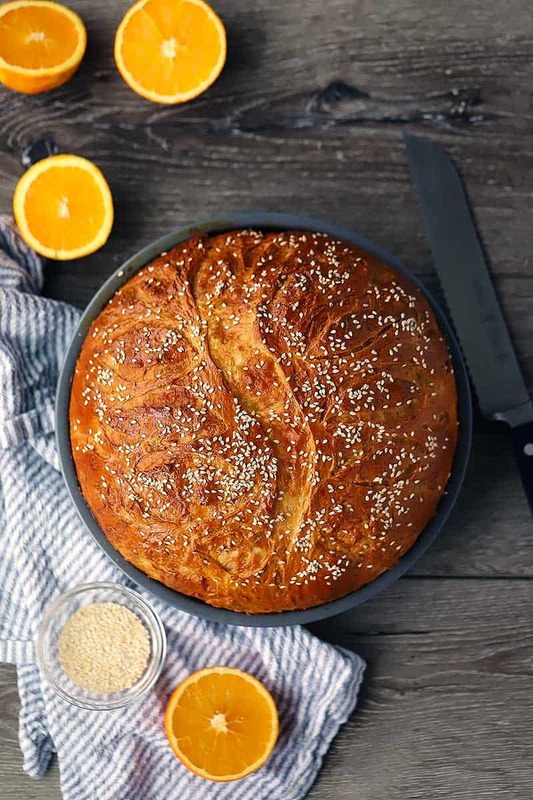 Eating vasilopita is a Greek Christian tradition that celebrates St. Basil’s Day, or New Year’s Day, but similar traditions are present throughout Eastern Europe. It’s traditionally sliced into at midnight at the New Year and served to each member of the family in order of age, starting with the eldest. Slices are often devoted to other symbolic people or groups, such as St. Basil or the church. There’s a rich history involving vasilopita, and you can read more about it here, but I’m going to start to get into how to actually make it! Because eating it is my FAVORITE part. To start, heat up 1 cup of milk and 1 teaspoon of sugar on the stovetop or in the microwave. Not too hot! You will add the yeast in the milk. The first time I made this I killed the yeast by heating the milk too high. It should be between 100-110 degrees (no need to use a thermometer to measure the temperature- you should be able to keep your finger in it and feel warmth, but not burning). Once the milk and sugar is warm, add 2 packets (or 4.5 teaspoons) of yeast. Whisk until dissolved, cover with a towel and allow to double in size (10- 20 minutes). Meanwhile, measure 7 cups of flour, 1 teaspoon salt, and 3/4 cups sugar into a the bowl of your standing mixer. You can use a wooden spoon or electric mixer to do this as well. Stir dry ingredients and make a well in the center. After the yeast is doubled in size, add yeast, 1 more cup of warm milk, 2 tablespoons olive oil, 4 beaten eggs, and the zest of one orange. Mix together until a smooth dough forms (add up to 1/2 cup more flour if necessary). Knead the dough on floured surface for about 10 minutes (or continue kneading in your mixer if you prefer). Swirl some oil in the bottom of a large bowl. Place the kneaded dough inside and turn once, allowing the oil to coat the top of the dough. This prevents drying out/cracking when the dough rises. Allow to rise in a warm place for 1-2 hours, or until about doubled in size. When I need to let dough rise, I usually turn on the oven light, turn on the temperature on for 1 minute, allow it to warm up slightly, and immediately turn the heat off. Then, I place the dough in the oven to rise. The residual heat as well as the heat from the oven light will keep a toasty (but not TOO toasty) environment for the dough to rise. Punch dough down and divide into two. Knead each for a few minutes and form into two balls. Butter two nine-inch round pans and place the dough balls in the middle of each. Place back in a warm area, covered with a kitchen towel, to allow to rise again for about 1 hour. Man, did I get a lot of new year’s day cleaning done while the dough was rising! 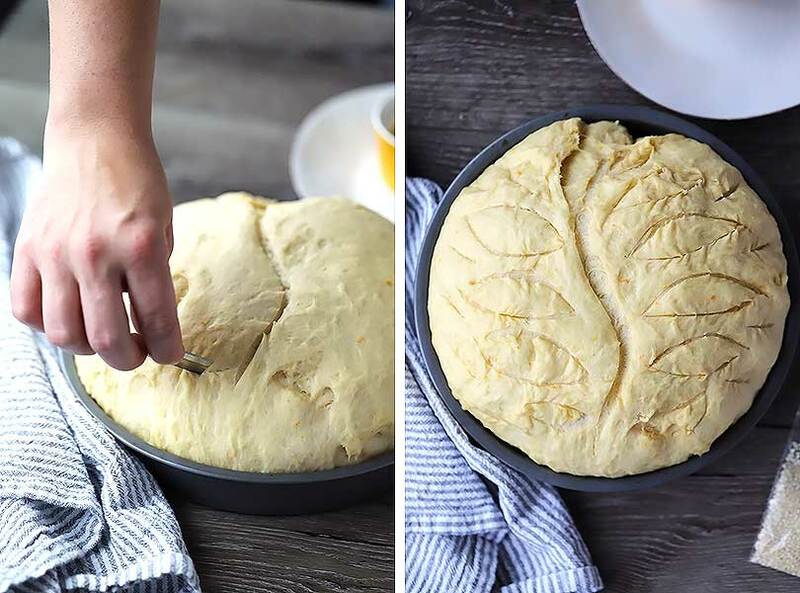 Preheat the oven to 375 degrees F. Once the dough has doubled in size again, use a sharp knife or clean razor blade to carve a pattern in the top of your dough. You can do any design you want, and a lot of people will write out the numbers of the year, or a cross shape, but it’s easy to start with lines that radiate from the center (curved or straight). Then, you can add other lines to connect them. I got a little fancy and did a vine with leaves coming out from it. FINALLY, beat one egg and brush the top of each loaf with it to cover it. Sprinkle with sesame seeds (some people use slices almonds instead), and bake for 10 minutes at 375 degrees F.
Turn the temperature down to 350 degrees F and bake for another 30 minutes, or until the loaves turn a deep chestnut brown on top. When they are done, allow them to cool for 10 minutes in the pan, then take them out of the pans and allow to cool on a rack. You may need to run a knife along the edge to separate it from the side of the pan. At this point, you can insert a coin (I usually use a dime since it’s small) through the bottom of one of the loaves, pushing it through with a toothpick or skinny knife. Yes, this is probably a choking hazard. Watch your little ones! There we go! Done! Phew! It’s very easy to cut the ingredients in half to make only one loaf, if you prefer. I like having this Greek New Year’s Bread with Black Eyed Pea Soup, another New Year’s tradition in the American south. 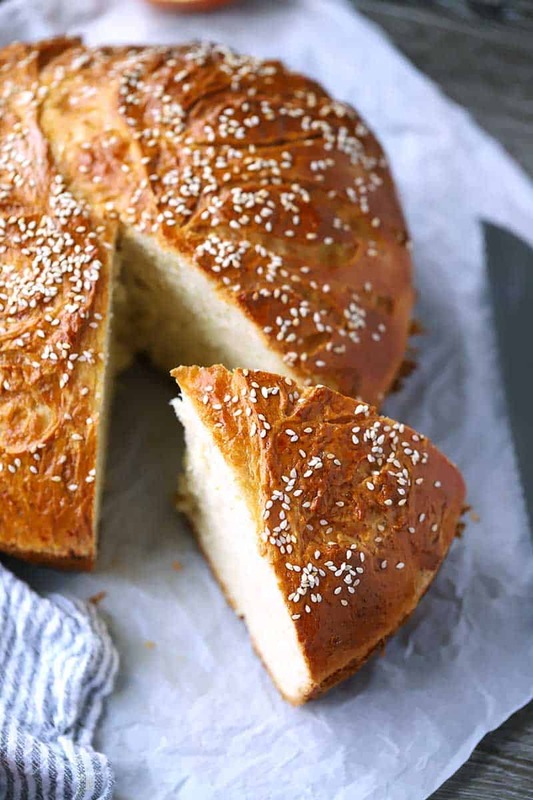 And if you like this vasilopita recipe, you’ll love these other Greek recipes for Manestra (Orzo and with Beef), Greek Spaghetti, and Greek Green Beans (Fasolakia). Here’s the printable recipe. Happy New Year, or as they say in Greek, Καλή Χρονιά! 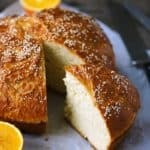 Vasilopita, or Greek New Year's Bread, is a sweet yeasted egg bread scented with orange and traditionally served on New Year's day. A coin is hidden inside and whoever gets it has good luck for the year. Dissolve yeast in one cup of warmed milk with one teaspoon sugar. Allow to double in volume for 10-20 minutes. Meanwhile, stir together 7 cups of flour, the salt, and the 3/4 cups sugar in a large mixing bowl. Make a well in the center. When the yeast has finished doubling, add to the well in flour mixture, as well as olive oil, 4 beaten eggs, the rest of the milk, and the orange zest. Mix with a wooden spoon until dough is smooth. Turn dough out on a well floured surface and knead for about 10 minutes, adding more flour as needed if the dough is too sticky. Place in an oiled bowl, turning once to coat the top. Cover and allow to rise in a warm place for 1-2 hours, or until doubled in size. Punch dough down and divide into two portions. Knead each for a few minutes and place in two well-oiled 9-inch circular pans. Allow to rise until doubled in size for about one hour in a warm place. Using a very sharp knife or clean razor blade, carve decorative patterns into the top of each loaf, such as with lines radiating out from the center. 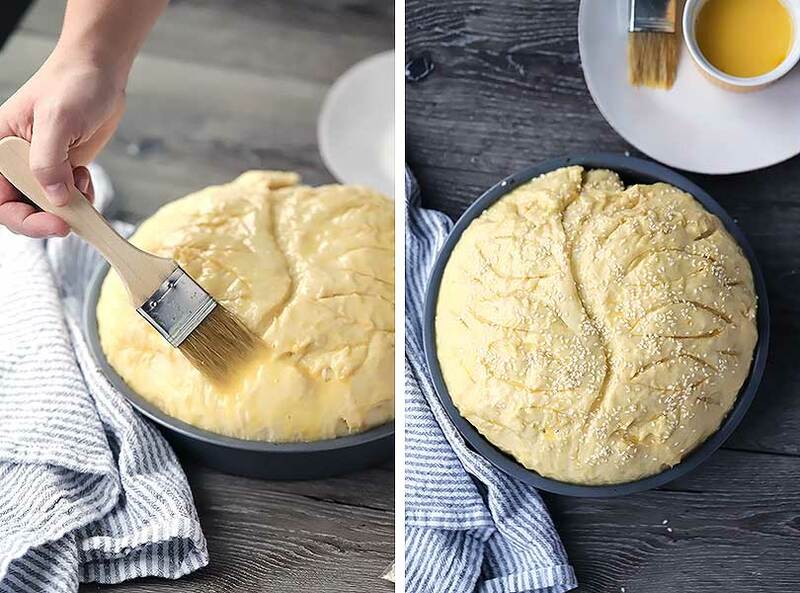 Using a pastry brush, brush the top of each loaf with the remaining beaten egg and sprinkle with sesame seeds. Bake at 375 degrees F for 10 minutes, then turn the temperature down to 350 degrees F and bake for another 30 minutes or until the tops of each loaf turn a deep chestnut brown. Allow to cool for at least 10 minutes before removing from the pan. Allow to cool completely on a cooling rack after removing it. At this point, you can insert a clean coin into the bottom of the loaf using a toothpick or skinny knife to push it in. You can read more about the rich history and tradition of Vasilopita here. This recipe is adapted from The Food of Greece by Vilma Liacouras Chantiles. This recipe yields two loaves- the amounts can easily be halved to make only one. The total time indicated does not include time to rise. 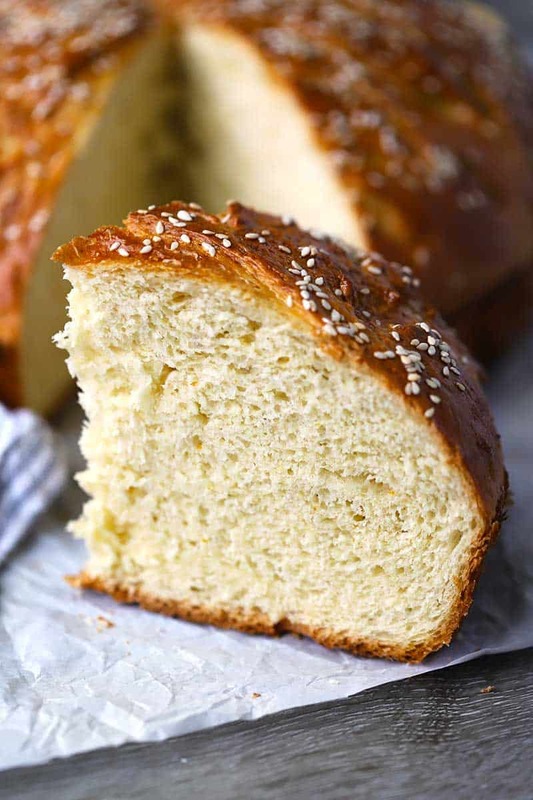 You will need 3-4 hours total to make this bread.